NVIDIA introduces four new Kepler-based workstation cards; the Quadro K4000, K2000, K2000D and K600. NVIDIA (NASDAQ: NVDA) today unveiled a range of NVIDIA® Quadro® professional graphics products that offer unprecedented workstation performance and capabilities for professionals in manufacturing, engineering, medical, architectural, and media and entertainment companies. NVIDIA Quadro K4000 - A high-end card that delivers blazing-fast performance for graphics-intensive applications. Has 3GB of onboard memory, multi-monitor support and stereo capability in a single-slot configuration. NVIDIA Quadro K2000 - A midrange card that offers outstanding performance with a broad range of professional applications. Comes with 2GB of onboard memory to hold large models and multi-monitor support for enhanced desktop productivity. NVIDIA Quadro K2000D - A variant of the Quadro K2000, with native support for two dual-link DVI display connectors for interfacing with ultra-high-resolution medical imaging displays. NVIDIA Quadro K600 - An entry-level card with great performance and certifications for leading professional applications. Equipped with 1GB of onboard memory, comes in a low-profile design for maximum usage flexibility. "With NVIDIA Kepler GPUs, we can create fully ray-trace rendered images of a bike before we actually build it," said Nick Schoeps, senior engineer at MotoCzysz, a Portland, Ore., engineering firm that designs, builds and races custom electric motorcycles. "Previously we'd rely only on still renders or low-fidelity motion during design reviews. With Quadro Kepler, we can work with highest quality settings always on. That's a huge advantage and something we hadn't been able to do before." Scale-up computation using the second generation NVIDIA Maximus™ platform, which pairs the Quadro card with an NVIDIA Tesla® K20 GPU compute card. Easily scale applications to higher resolution using NVIDIA Mosaic technology, which combines up to 16 displays as a single large display. 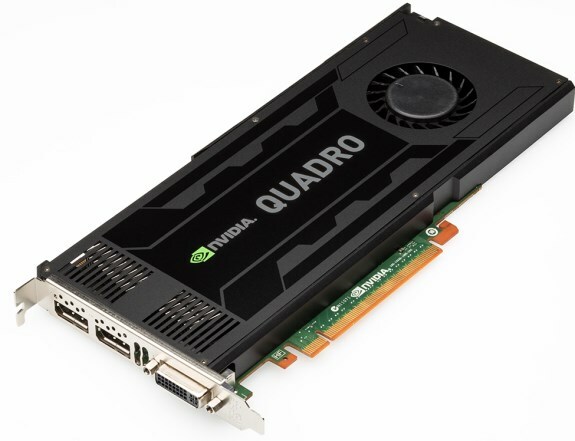 "NVIDIA Quadro with Kepler architecture offers no-compromise workflow acceleration for customers with exacting computing and graphics demands," said Sandeep Gupte, senior director of the Professional Solutions Group at NVIDIA. "Kepler offers a future-safe GPU solution, whether professionals are integrating more realism and physics into their manufacturing designs or dealing with the complex demands of 4K workflows in broadcast and film." In manufacturing and AEC (architecture, engineering and construction) industries, professionals can work with complete assemblies and visualize more of their designs, with more realism, across a larger display surface. Architects can now harness the compute power of Quadro GPUs to showcase their vision to clients with amazing realism, using physically accurate rendering techniques. In media and entertainment, content creators can enjoy fast performance and features that enable them to tell dramatic visual stories without interrupting their creative flow. Film editors and animators can work with more interactive visual effects to create richer scenes with more textures and smooth interactivity. "Our Kepler-based Quadro card driving the Premiere Pro Mercury Playback Engine blew away our Final Cut performance," said Anthony Safarik, editorial supervisor at Stargate Studios, an award-winning production company in South Pasadena, Calif. "With the Quadro K5000 and Adobe Premiere Pro, we eliminated an hour of upfront rendering and another 20 minutes of rendering the linear effect on top of that. That's substantial time savings, especially when a roomful of producers, directors and visual effects supervisors are standing over your shoulder."